Letters to Elijah: The guy with the big ears! Later this month I'm going to do one of the most un-frugal things you can do in America. I'm taking my kids to Disney World. Let me correct that - my Mom is taking myself and the kids to Disney World. If it wasn't for my Mom taking us, the kids would have to wait until they were adults and pay for it themselves! So how does one do Disney frugal? (is it legal to put Disney and frugal in the same sentence?) I think it's going to be one of those times when I won't be frugal. Naturally there are going to be some souvenirs. The exciting part is all I have to pay for is spending money. Everything is included. But the best part is my sister from Canada and my sister from Texas will be joining us too! 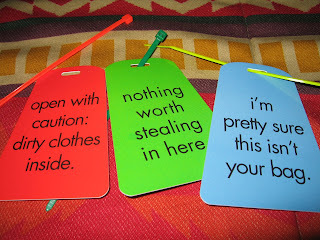 Today my sister sent these luggage tags. Don't they make you smile? Any of you been to Disney World? Any advice? "Any of you been to Disney World?" Yes, actually I have an annual pass. Disney and Frugal do not fit in the same sentence, but you can do it somewhat cheaply. 1) You can take in a reasonable amount of snacks. You can even take in your lunch if you wish. 3) The tap water on Disney property is nasty. You will probably want to drink bottled water. Buy a case if you are able. 4) It commonly rains EVERY afternoon in Florida in the summer. Be prepared, or else you will find yourself tempted to purchase an $8 cheap disposable poncho. I'll keep thinking... I have sent you an email once. If you still have my email, you are welcome to ask any questions. My mom purchased the Disney Dining Plan. So my meals are paid for. I know that I do have to pay for the tip (b/c there are 8 of us it will be 18 gasp %) We have made reservations at all 4 parks. There is a general store at Disney's Fort Wilderness (don't know about cost) as well as numerous convenience stores/gas stations throughout the property. I don't know about your transportation - if you are utilizing Disney transportation 100%, it will get you to Fort Wilderness, but I am not so sure about the gas stations. Good job getting the dining plan. It will save you money. Since I am local I have never used it, but I know that it is worth it. Also, when in the park(s), visit the Guest Relations building, where you can get a FREE special occasion souvenir button "First Time Visitor". This will probably please the kids. free button.. love that idea! Great tip!